Time once again to explore a new area of the Pacific North West. 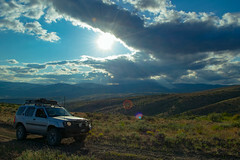 This time the adventure led towards the Wild Horse wind farm and Colockum Pass northeast from Kittitas, WA. Never been in this area before so I had little in the way of expectations. My trail buddy, Dana, and I met at Mule Expedition Outfitters new garage/fabrication shop before heading east over the I-90 pass. The incessant rain on the west side of the mountains finally ceased once we crested the pass and the sun began to make sporadic appearances. Pulling over in Ellensburg, WA, we stopped for supplies and a final check of our rigs before traveling eastward along Vantage Highway. This highway reminds me quite a bit of I-80 in Nevada, especially near Winnemucca, NV. Picture a vast, bowl shaped valley covered in dry, brown sage brush book-ended with hills and modest ridge lines on both sides; golden-orange sunlight illuminating several patches of thin cloud cover. Quite beautiful. The entrance to the Wild Horse wind farm is readily apparent with its Texas ranch-like arch over the entrance. After a quick security chat with the guard we continued up into the hills between the huge wind turbines. These things are bigger than a 737, which is only apparent once you get up close. Continuing on to the north along Beacon Hill Ridge road, we left the wind farm property and finally connected with more ‘Green Dot’ trails. So many, as a matter of fact, that it would take one a very long time to explore them all in this high desert steppe. We explored a few of these but it was mostly by accident rather than design when we took a wrong turn. The trails come in a variety of mediums, from smooth dirt tracks to very rough volcanic scree, so be prepared. Personally, airing down the tires is mandatory on these sorts of tracks as it really helps with the ride smoothness and, of course, better tire grip. Connecting with Colockum Ridge road we traveled further and made it over Colockum Pass, which had the remnants of a minor snowfall; expected for this time of year. Overall, the weather conditions progressed from partly overcast to a constant light shower the higher in elevation we traveled. Even with the wet conditions the trails all remained easily passable. One offshoot trail took us up the steep incline of a hill which was surrounded by low lying fog, which ebbed and flowed like a ocean tide. Video of that here. Time lapse of the whole thing here. Airing up the tires in the pitch dark.